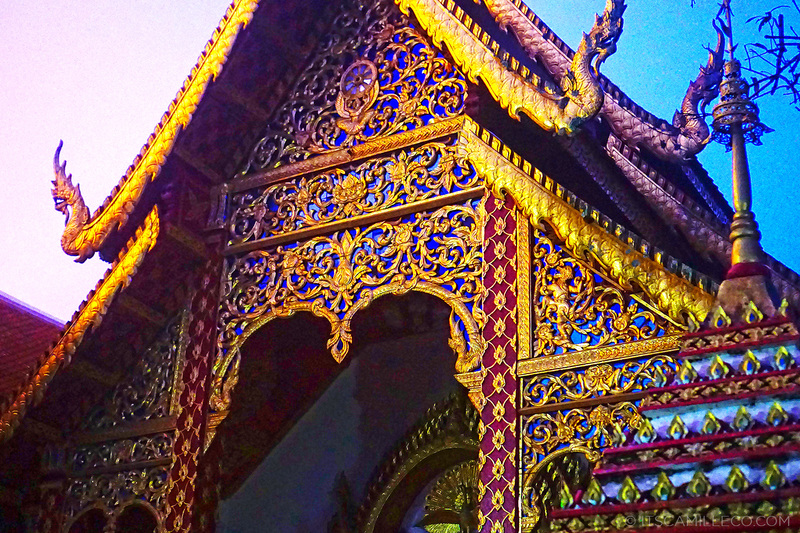 After a series of delayed flights, we finally arrived at the city of Chiang Mai. Since I was traveling with my sister and she’s always ever so efficient, she made sure we wasted no time touring around the city. 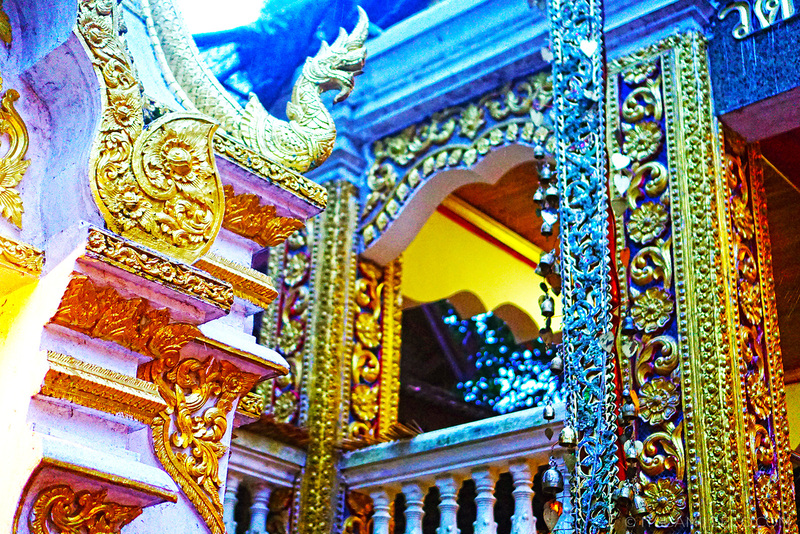 From the moment we landed, we already had a private tour guide waiting to take us to one of Chiang Mai’s most sacred temples, the Wat Phra That Doi Suthep. Ideally, we wanted to catch the sunset there. 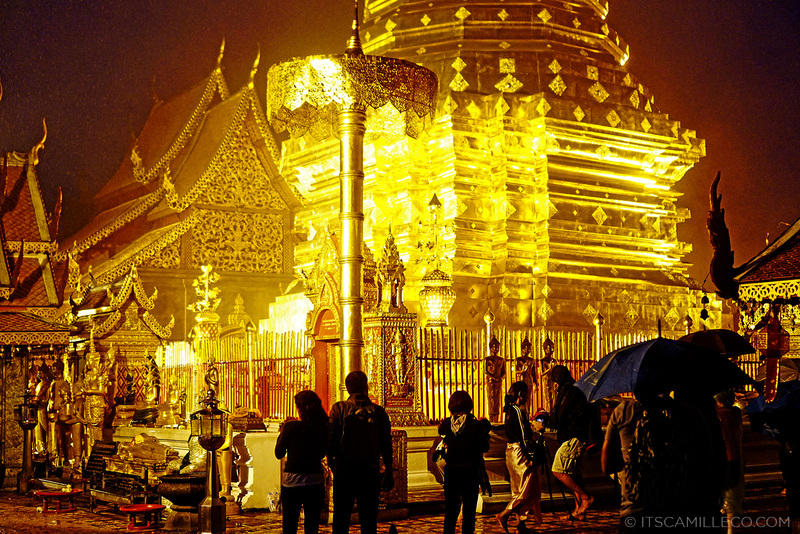 Because the temple is located on top of the Doi Suthep mountain, which is 1053 meters above see level, it offers an incomparable view of the entire city and the most dramatic sunset. Unfortunately though, as all tourists know, things don’t always go as planned. Mother Nature just wasn’t feeling it that day. 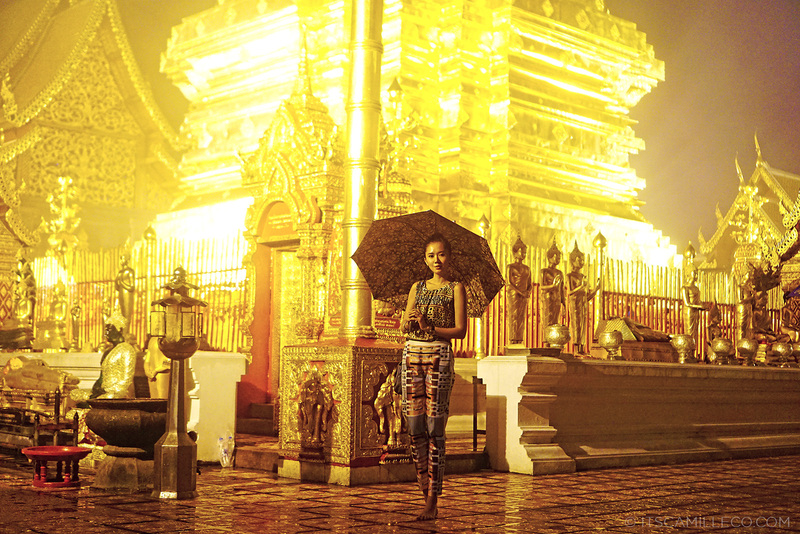 The weather was gloomy and it was raining the entire time so we weren’t able to catch the sunset nor see the temple’s view of Chiang Mai. All we saw was fog. The travel blogger in me wanted to cry. Despite this, we continued on with the tour. 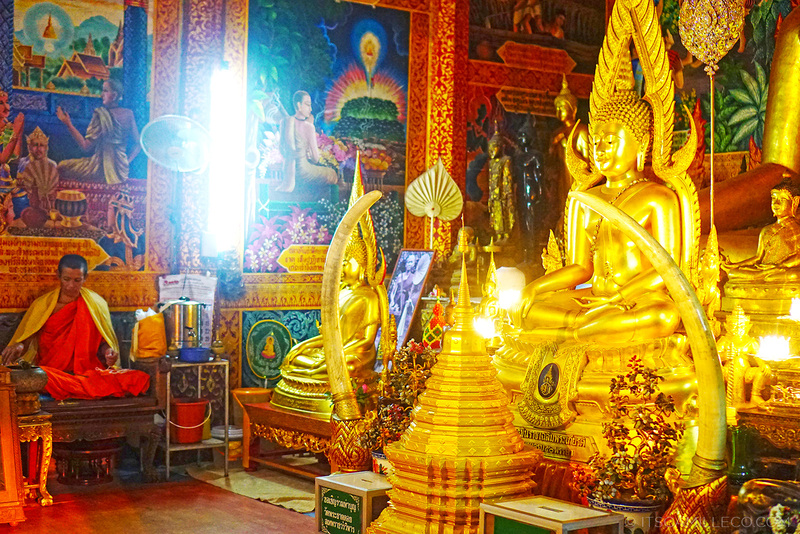 Tourists have the option to climb up the 306 steps to reach the temple or ride the funicular for 20 Baht. We took the latter option since it was already dark and the rain hasn’t stopped pouring. 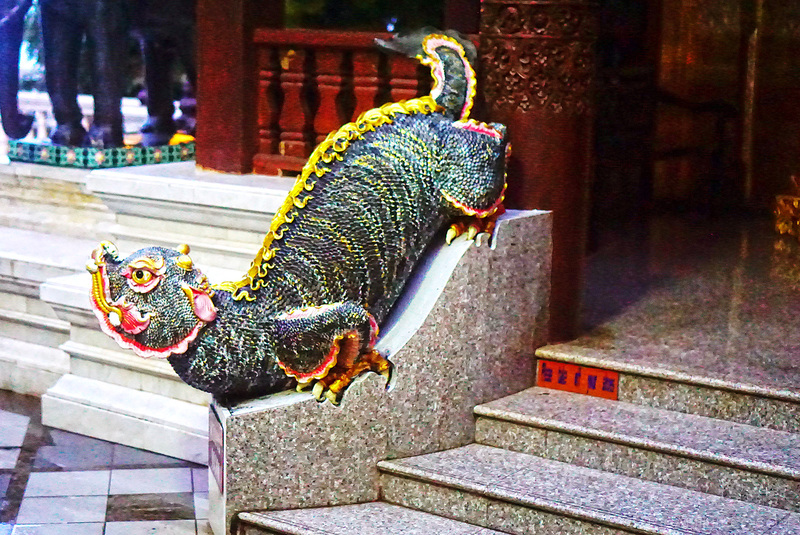 If the weather is better, I’d definitely recommend the first option so that you can marvel at the intricately carved mythical Naga (Serpent) Staircase and its surroundings. 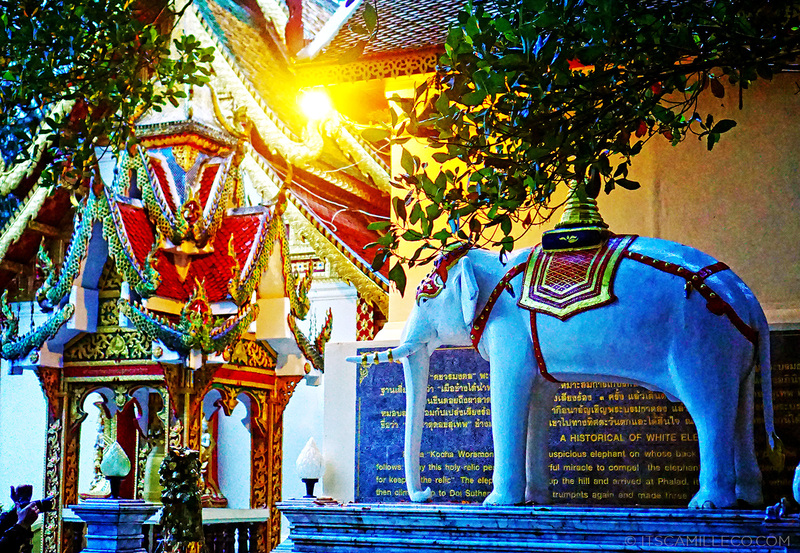 Once you get to the first level, you’ll see the White Elephant shrine right away. This was built in honor of the White Elephant that chose the temple’s location. 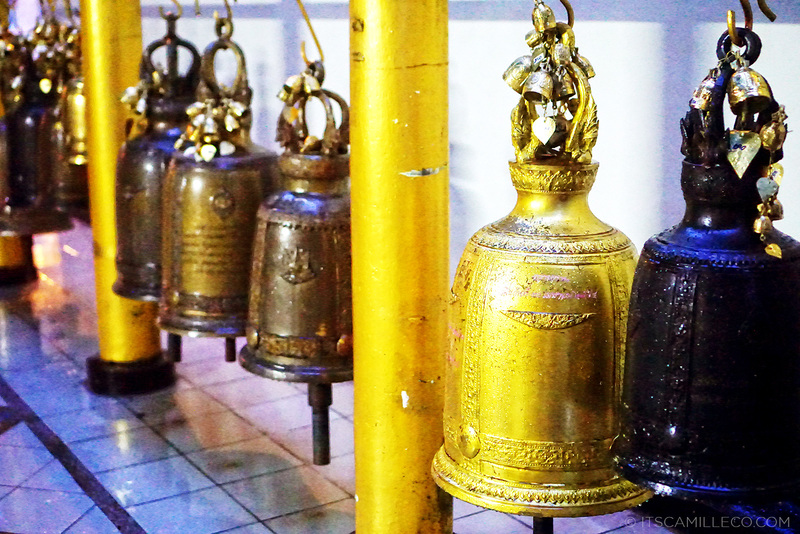 Legend has it that when a monk named Sumana found a miraculous relic believed to be part of Buddha’s shoulder bone, King Kuna built Wat Suan Dok (which means Flower Garden) to house it. 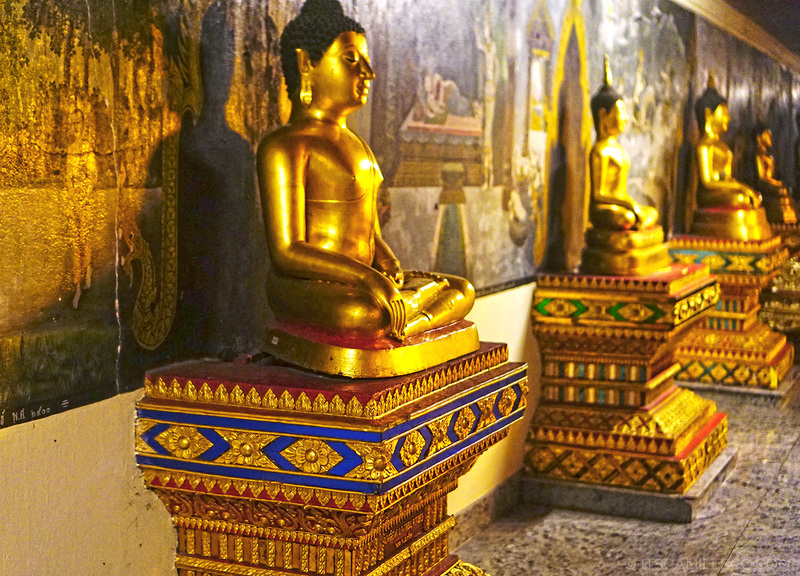 While moving the relic into Wat Suan Dok, it miraculously divided itself into two pieces, with each piece growing back to the size of the original. 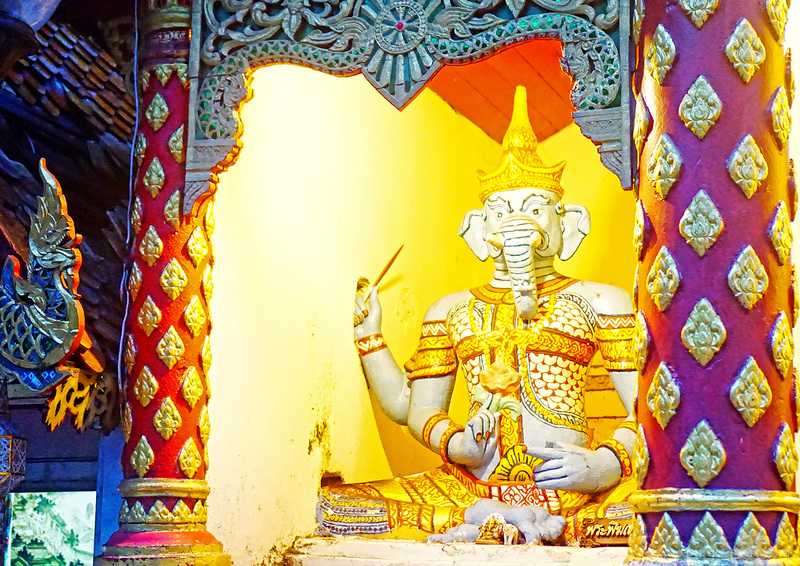 King Kuna felt the second piece of the relic needed its own temple as well so he placed it on a White Elephant and released the elephant into the jungle to look for divine guidance. 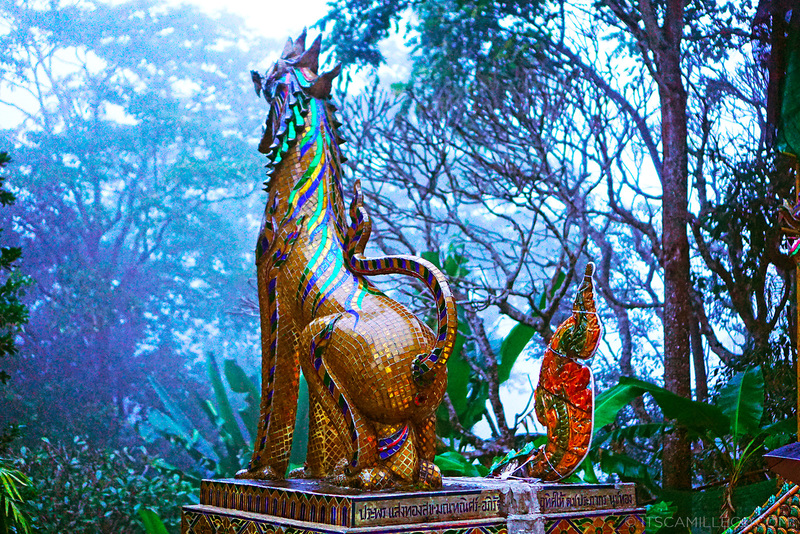 The elephant climbed and climbed until it reached the peak of Doi Suthep Mountain, trumpeted 3 times, made three counterclockwise circles, and laid down refusing to go any farther before it died at the site. 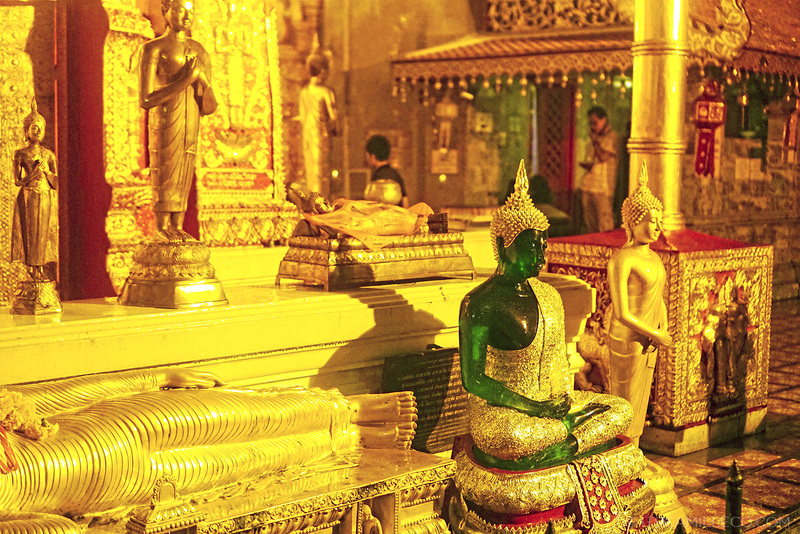 The King took this as a sign and built the temple there in 1383. 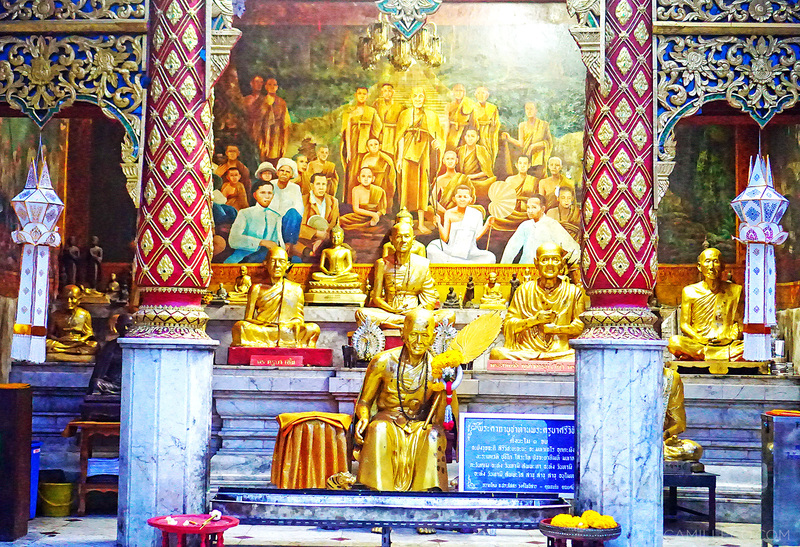 Now, aside from the White Elephant Shrine, you’ll see plenty of other shrines enclosing the main golden pagoda or chedi–like the Shrine of Thao Mahaprom Statue and Shrine of Hermit Statue of Sudeva, along with copper bells, brightly colored murals and a Bodhi tree. Everywhere you look is a visual treat! The main attraction, however is located on the 2nd floor terrace. 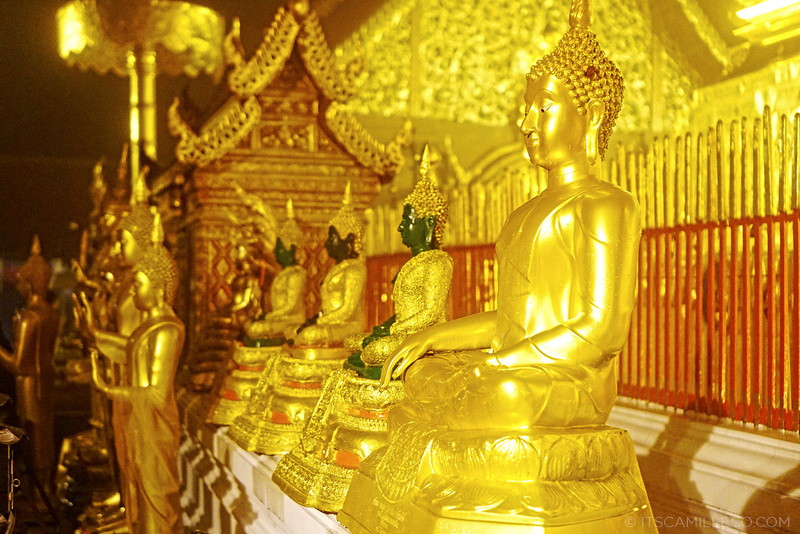 At the center of the upper terrace is the picturesque golden pagoda or chedi that enshrines the relic. 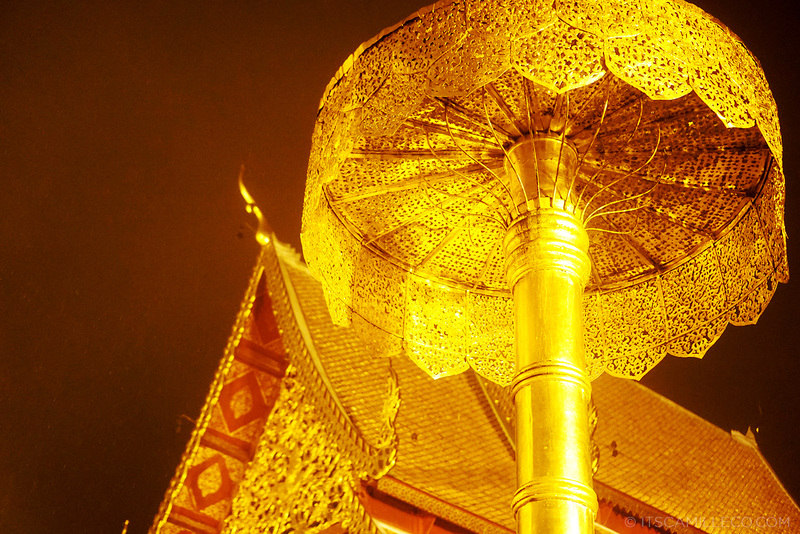 It greets you with its five-tiered umbrella built in honour of the city’s independence from Burma and its union with Thailand. I had to walk around barefoot because it was a scared area but I wasn’t really minding my feet getting soaked in the rain. 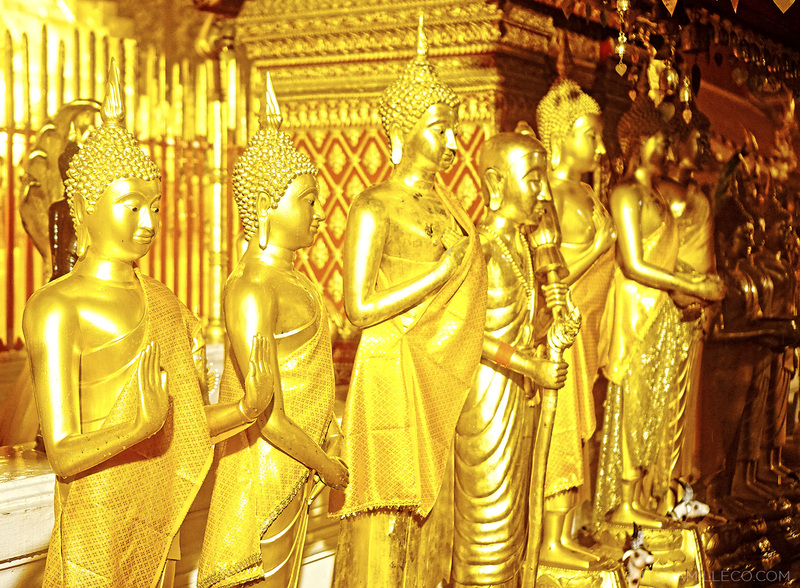 I was in complete awe of the golden chedi and the buddha shrines around it! Seeing all of them upclose felt so unreal! I had to make sure my jaw hasn’t dropped to the floor by the end of the tour. 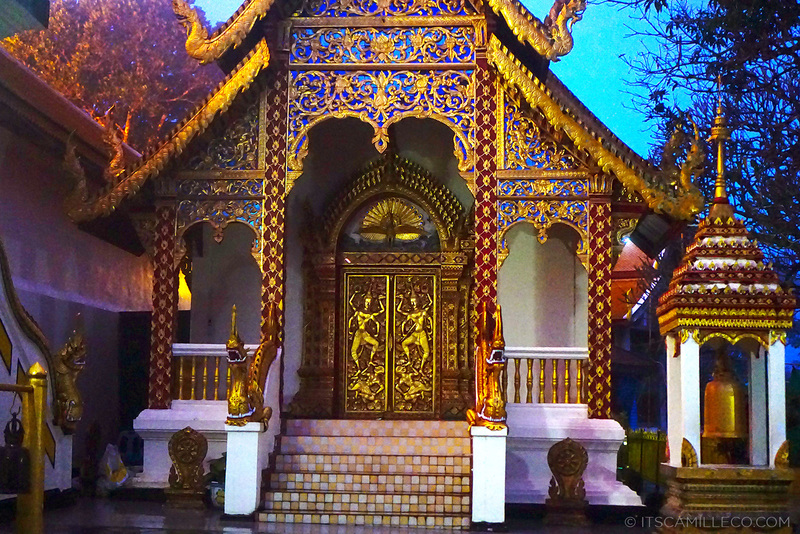 If you ever visit Chiang Mai, good or bad weather, make sure you visit this temple. It is a must! P.S. Be respectful of the dress code. Wear long pants and make sure your shoulders are covered. 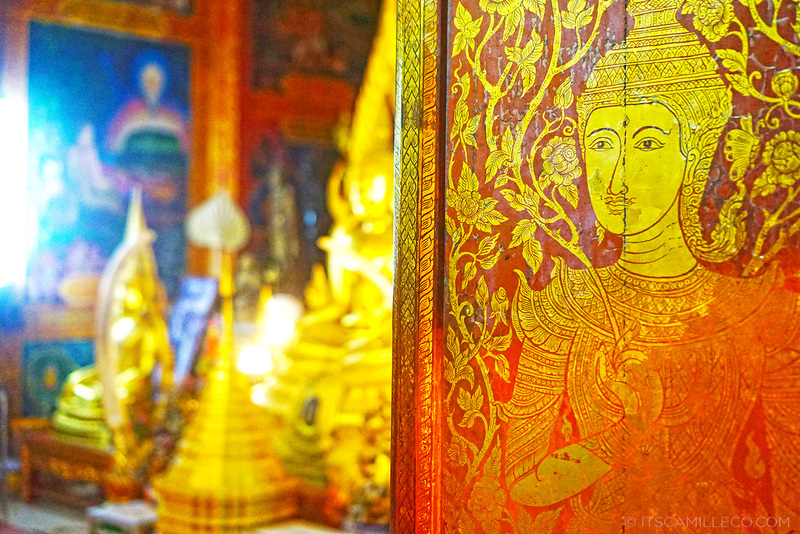 สวัสดีและ ความปรารถนาดี I spent four months in Chiang Mai and the surrounding mountains in 2013, and I grew to love the city and people and temples… So many temples there. 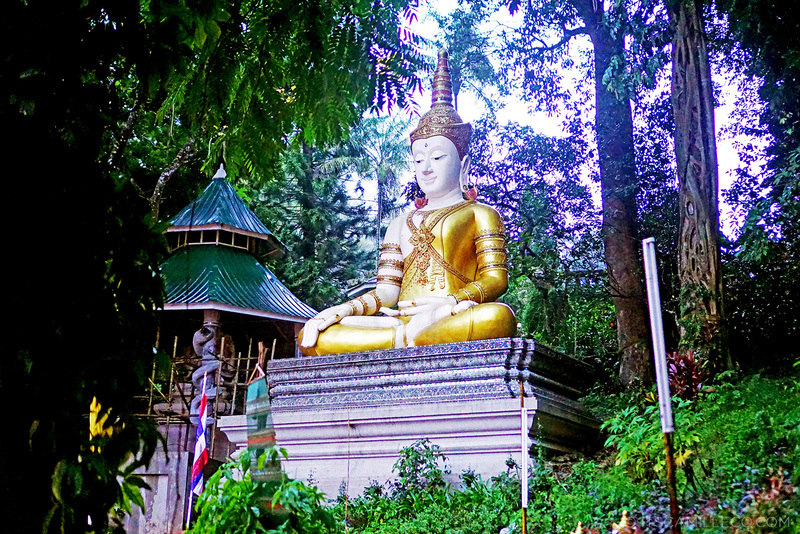 Visited Wat Phra That Doi Suthep three times. 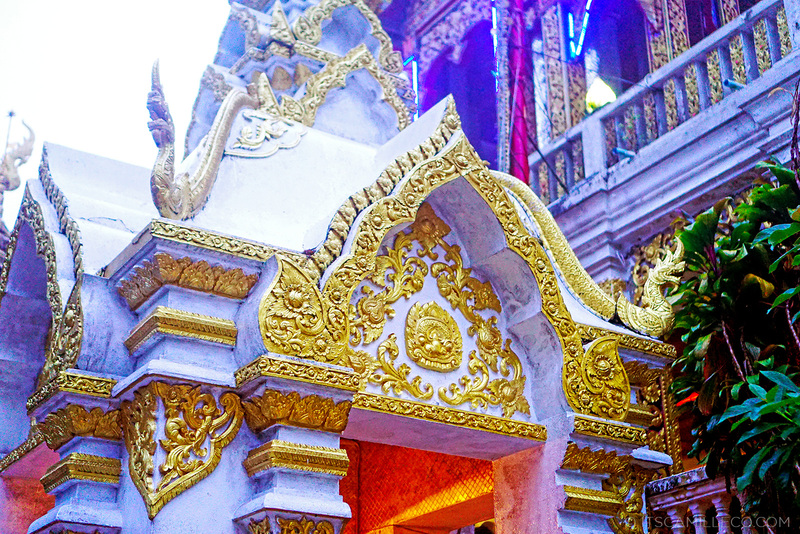 And also Wat Chedi Luang five times…. 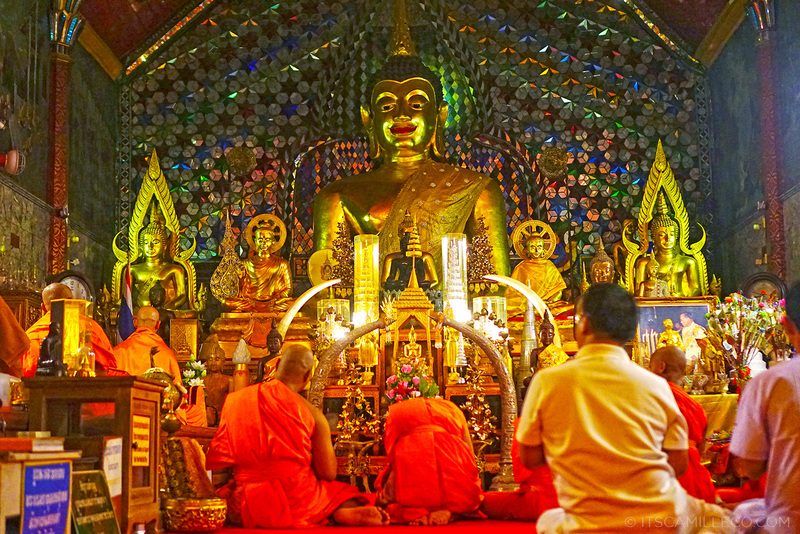 spending time chatting with monks and taking part in prayers and rituals. All together I probably visited about twenty five temples in the area. Hoping to return later this year, or next year. Long 14 1/2 hour flight from Toronto,Canada to Hong Kong… then 2 1/2 hour flight to Bangkok, then another 1 hour flight to Chiang Mai… I’ll be 65 in November… so have to go so while I’m still strong enough to carry my max carry-on size backpack. Yes.. 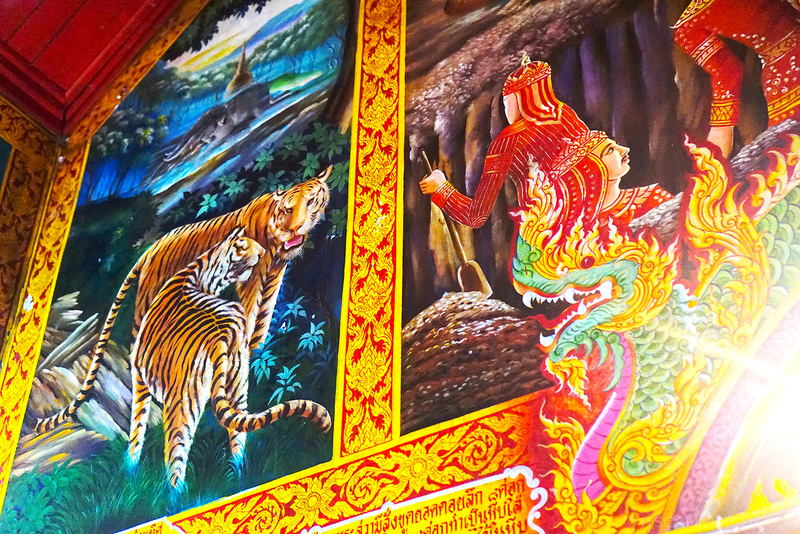 I have taken refuge in the Triple Gem, and taken the Five Precepts. 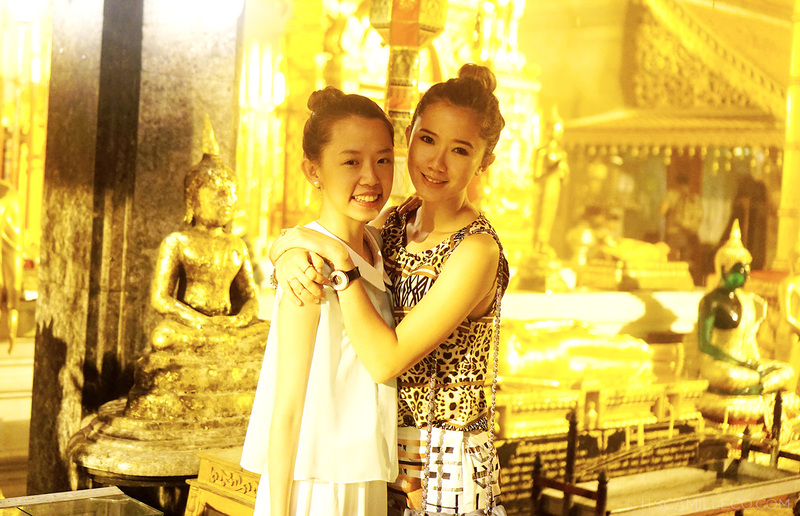 I’m a Buddhist in the Theravada tradition now..
Glad that you like my hometown. Welcome and be our guest again anytime. In the year BE 2477 (1934 A.D.) at that time the government couldn’t raise sufficient money to build the road, so Kruba Srivichai, the most revered monk of Lanna Thai, from Lamphun, Wat Ban Pang, came to Chiang Mai to initiate the road construction project which linked from the foot of the mountain to the site of the pagoda. Because of the fact that there were more people than needed, Kruba Srivichai requested that workers from each village should contribute only 50 feet in length of road construction. However, due to the increasing number of volunteers, the monk limited the construction to only 10 or 15 feet per village. It’s very wonderful that the road on the mountain which is 11 kilometers long was completed within five months and 22 days without any government fund and in spite of the fact that those days volunteers used only hoes and spaded as their tools; modern machines were not yet available at all. 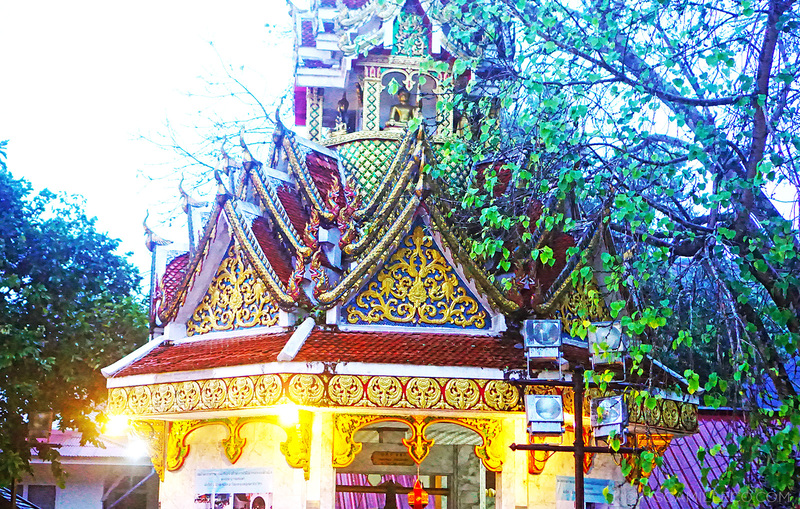 Wat Prathat Doi Suthep is really a sacred place for Chiang Mai locals. 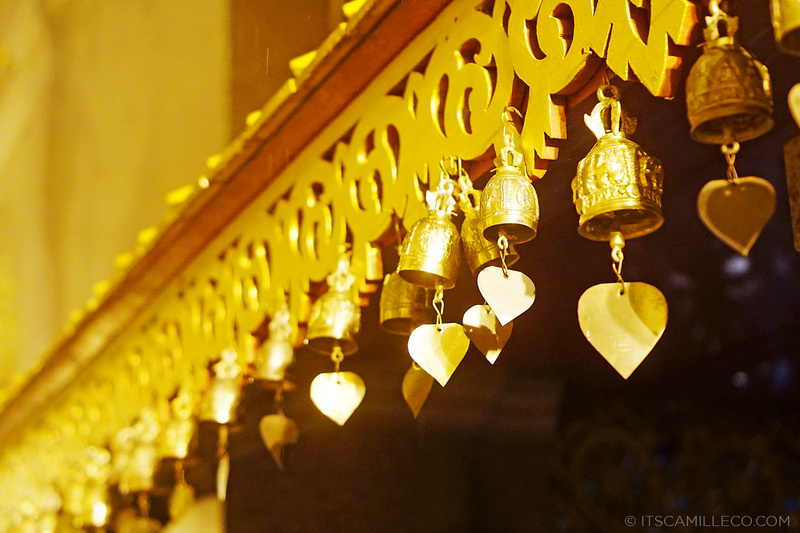 There’s a tradition made for 50 years by Chiang Mai University students, esp. 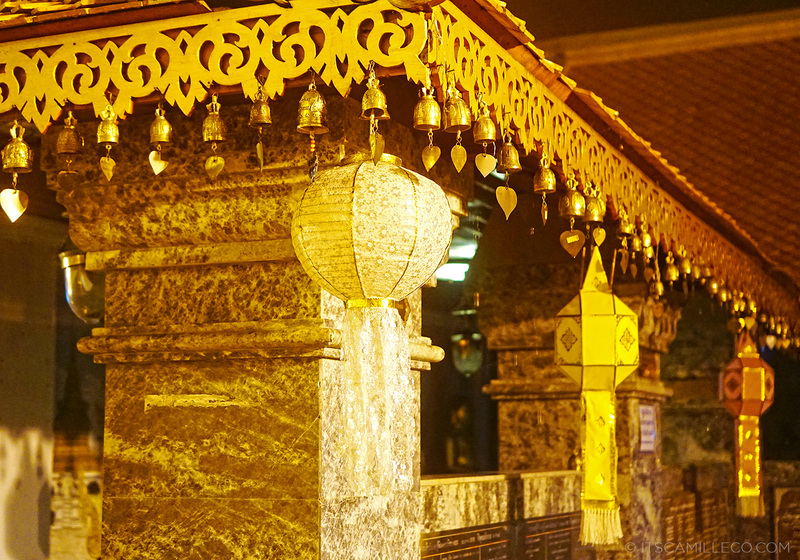 freshmen, to walk 14 kms from the university up the mountain to worship the temple. Faculty of Engineering will carry a small stupa and be the first of the parade, while Faculty of Fine Arts will be the last with a long strip fabric to covered the base of the Chedi. There is only one rule: No body get left behind. if your friends tired, you have to help them. If your friend is disabled person, you have to push his/her wheelchair. If your friend cannot walk, you have to carry him/her. Wow! That’s such a cool story, especially about the “nobody gets left behind” part. So enlightening! Thank you for this!! Wow!!! Everything is gleaming!!! I wouldn’t mind getting soaked too if I will be able to see this view! carried the print on print look so well!! :) Ate diba, be cautious of the dress code but why you and your sissum’s shoulder are exposed? hmmn.. 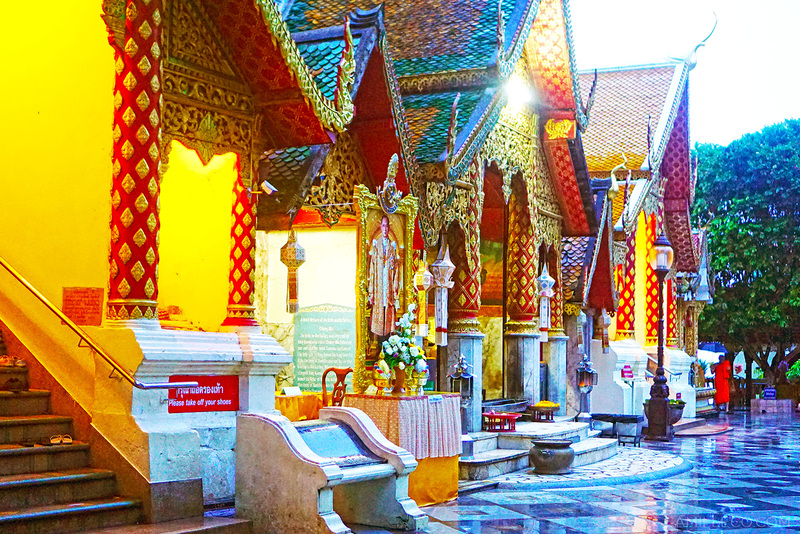 The temple… I can’t even.. It’s so majestic! Everything looks so expensive haha those details, wow! Truly magnificent! This has to be the most majestic temple I’ve ever seen compared to the ones in Japan and Korea. I mean, I can’t really believe all those details! I can’t wait to see more of these in your next blog post! Would you recommend your tour guide? Where can we reach her? Wow, that is a lovely post, colours are so cool… congrats!! I love your style.. Have you dream of having a reality series like Rachel Zoe Project or Fashion Bloggers? I think it would be great for you and your fellow bloggers..Hehehe.. Just suggesting..Been so long since I check your blog.. The Co sisters love the hair bun! Matchy-matchy. So cute! This is why having a sister has its perks! You’ve got really amazing photos Cams given that the weather was gloomy. Love those photos! I am sorry for your delayed flights and the weather. Was not expecting such beauty and bombardment of colour! Woah so beautiful! Your travel diary is always full of information! I jist love it so much :) i love how you walked barefoot even though it was raining! Walang arte arte! Taray! Hahaha LOL!